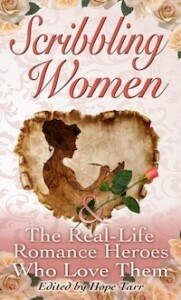 In Scribbling Women and the Real-Life Romance Heroes Who Love Them, twenty-eight romance fiction writers from diverse subgenres reveal their real-life stories of how they met, wed and love—and are loved and supported by—their spouses and life partners. At times whimsical and laugh-out-loud funny (Jacquie D’Alessandro’s “Donny & Me?”, Nikoo and Jim McGoldrick’s “Soul Mates for a Thousand Lifetimes”), at others poignant and bittersweet (Elf Ahearn’s “A Lost Friend, A Movie Star, A Man to Love Forever”), all unfailingly inspiring (Lisa Renée Jones’s “Unexpected Treasures”; Deanna Raybourn’s “Once in a Blue Moon”), each essay celebrates that most powerful and sacred of human bonds. Love.